Villa America, known as the most elegant of all the inns built in the vicinity of the Coney Island Amusement Park before the triumph of the Revolution, is located only a few meters from the Fifth Avenue, very close to the Playa roundabout. Up until the beginning of the 1990’s, its comfortable rooms used to be rented for short-time stays to a long line of secret, passionate or occasional lovers or adulterers. The Coney Island became known as the dating centre of the Cuban capital and the nearby beaches were often sought by people eager for a social chat. When they needed temporary accommodation, they used the services of Villa America. Their number grew over time and Villa America thus became a haven for many. In March 1993, however, a hundred-year storm brought the glory of the place to an end. When the rare storm devastated the neighbourhood of ​​La Puntilla (Miramar), dozens of families lost their homes and high-ranking officers of the Revolution government gave an order to convert inns into hostels. Villa America, whose accommodation capacity at that time consisted of 26 rooms, housed 26 families, which, naturally, multiplied over time. Each room served as home for one family. Maria del Carmen Grell came to live in one of those rooms on August 23, 1993. The robust black woman who has spent her whole life working told us that the place was in better conditions back then, when it was an inn. “Villa America is now, more than ever, a temple of perdition,” says Maria del Carmen, who is a community services worker in the Playa municipality, where she cleans the streets. She dreams of living long enough to get decent housing that she has been promised by the government. A man arrives from the floor above. He is very skinny and looks sick. His name is Nelson. He invites me to go up to his room to take a look. It’s on the top floor and the long corridor is lined with closed doors of the rooms which once used to be rented by couples exchanging kisses and caresses. Today they provide haven for the faded and vague faces of those who have fallen prey to the need for survival. Nelson lives in a crammed room, like everyone in Villa America. He says that his children sleep on the floor because there is no place for another bed. The room is filled with the smell of moisture and mould. He tells me that he has also been given a house once. They told him to pack up all things, that they would pick him up the following Monday. However, the house suddenly vanished and since then he hasn’t heard of it anymore. Not that he would want to ask, either. 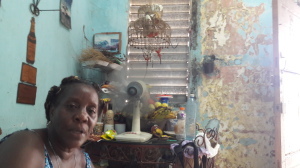 After the visit to Nelson, I return to Maria del Carmen’s room and she tells me that over the 26 years, Villa America has been tended by 15 maintenance brigades, which, however, have never fixed anything. “They stole the cement and the materials, pretending they were doing some small jobs while they loaded everything on a truck, even new toilet bowls intended to replace the old ones.” Maria shows me hers, which has been broken for a long time. Maria hangs up her clothes in an improvised wardrobe under the kitchen unit. The clothes are wet and mouldy. She shows me a shirt, which, as I learn, is very important for her. When leaving, the oldest inhabitant of Villa America takes me out to show me the ditch.